We have shot glasses in Cobalt (Blue) Rim, Amber Rim, Solid Confetti, Confetti Rim, Green Rim and Clear/Natural glass. All of our Glassware is dishwasher safe and 100% Lead Free. No two pieces are ever exactly alike in size or shape, which adds to their charm. Glasses sold in a minimum purchase of 2 per style. Don't be fooled by the imitation glass from overseas that looks hand blown but is not! 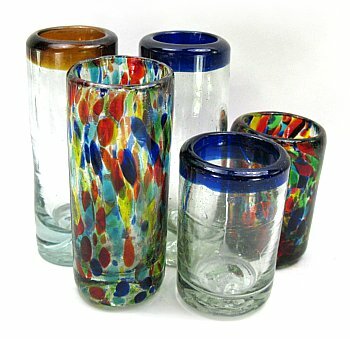 This imitation glass is machine made, very thin, and no where near the quality of authentic Hand Blown Mexican Glass. Mini Brandy Snifter Glass, 4-5 oz.